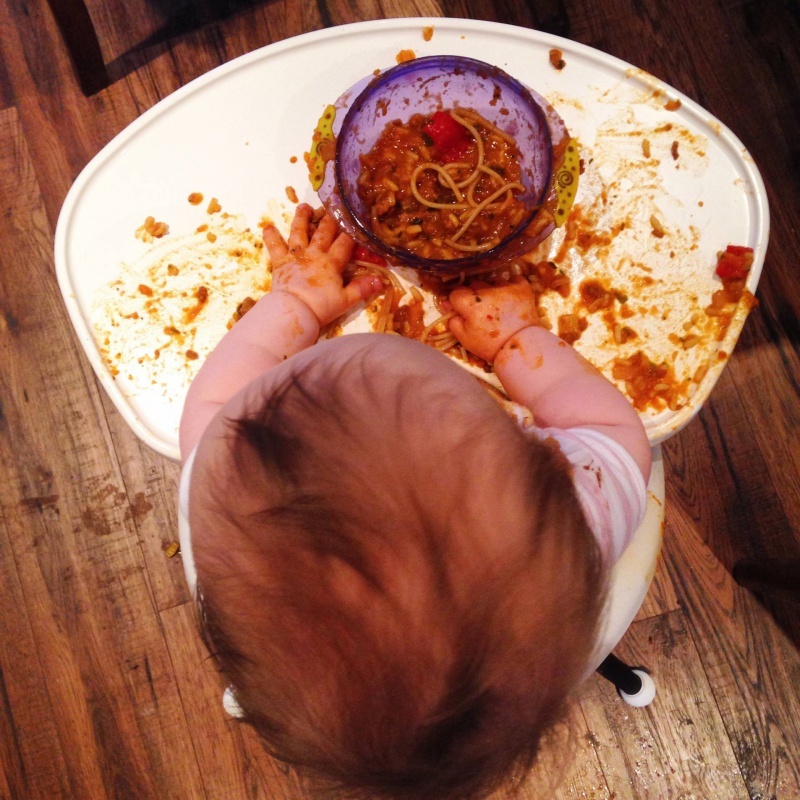 It’s ‘baby-led’ in the sense that you let them do what they need to do while they’re learning, parents just need to be a bit cold blooded ( your child will gag but not choke) and not care too much about getting messy because it is really messy, but also fun! Get ready to get some of the best pictures of your baby! Why BLW is better for children with a Visual impairment? Try to imagine sitting on a chair, not seeing clearly and all of a sudden a spoon appears and get stuck in your mouth with something - I don’t think anyone would like that sensation especially considering that until then they have been breast fed or bottle fed in the loving arms of their mum. BLW is good for any baby because it helps them also in developing healthy tastes; it helps teething and helps them being independent. Well there is no point in me lying; BLW is messy, really messy. But if you are weaning during the summer you can eat outside and leave the baby only with her nappy on, if its winter well buy a messy mat and pop it under the high chair. Buy a cheap, all plastic high chair, like Ikea Antilop, if it really turns into a nightmare you can always pop it under the shower to rinse it down. You will save a lot of time with the cooking so you can spend a bit more of time in cleaning up; your baby will soon become an expert in eating up so it doesn’t last too long. Some people can get really nervous when they see their wee baby struggling with food in their mouth, I remember when I was weaning my boy, and my mum would stay around waiting for the first sign of gagging just to start shouting “He’s chocking! !” then she would slap his back and we would end up with an upset child, an angry mum and a granny in tears! But what is the difference between chocking and gagging?! Gagging, as opposed to choking, is actually a safety response to food travelling too far back into the mouth so when we see our babies gagging they are actually handling the problem and it’s best just to keep calm (or at least look calm) and wait until it passes and give them a wee drink of water immediately afterwards. If it makes you feel better take a First aid course for parents, it’s always useful to know what to do in emergency situations. Place the food on the high chair tray to have a good “colour contrast” base, usually they are white. Cut the food in big chucks easy for the baby to grasp. Use a large variety of food with different colors, tastes and consistency. Don’t make it difficult for yourself: give the baby what you are eating, just season your own portion after cooking as salt is not good for babies. Make it a sensory experience: use lots of spices, try new things maybe even you have never tried before. Don’t use plate or bowls, the experience is supposed to be: wow I have mango in my mouth not wow the bowl is flying across the room. 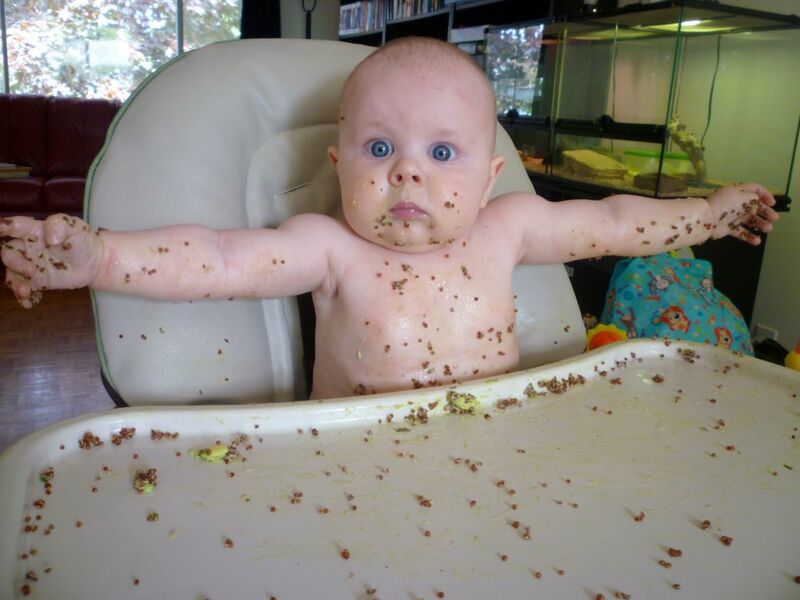 Don’t put too much quantity or too many different foods, it’s just going to confuse and overwhelm your baby. First snacks ideas: boiled carrots, banana, mango chunks, rice cakes, cheese slices, boiled eggs (cut in quarters), broccoli florets…. Have a camera ready to capture those first gummy, carroty smiles because as daunting as it may seem, weaning is a very short time in your child’s life, so relax and enjoy your baby making this amazing experience. 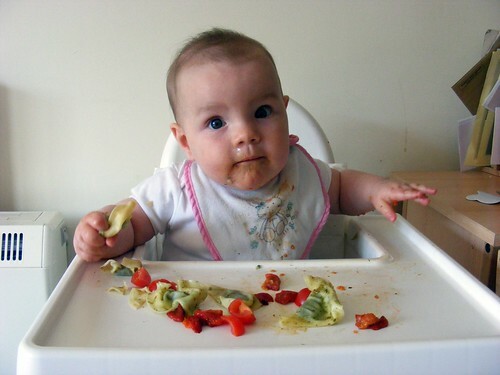 Make dinner a family meal: there is nothing sadder than eating alone, let the baby participate to the family meal.